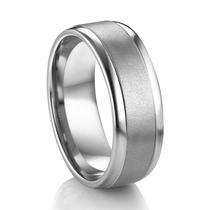 You aren't a basic bride or groom, so why should your wedding ring be? Diana wedding bands are elegant and sophisticated yet remarkably modern, perfect for the particular spouse-to-be with an eye for the exquisite. We carry stunning Diana wedding rings made of palladium, platinum, tungsten and other durable, long-lasting materials at Titanium Jewelry. For nearly 100 years, this maker has been one of the most preferred wedding band manufacturers around. From simple flat palladium bands to the exquisite Diana Platinum Wedding Ring with hammer-finished palladium and platinum, this designer offers a style for all jewelry profiles, whether it's cutting-edge and contemporary or timeless and traditional. 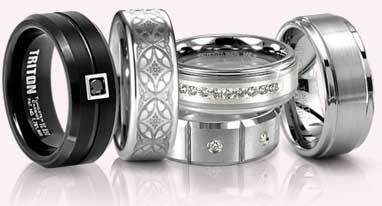 All Diana rings come with a 5 year guarantee and free, insured shipping when you buy from Titanium Jewelry. 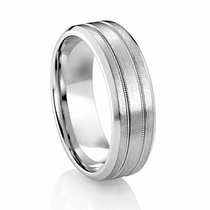 Let us help you with your Diana wedding band. Fine jewelry for simple, modern tastes isn�t always easy to find. If you prefer something less ornate and more minimalist, check out this selection of beautiful wedding bands by DIANA. This jewelry designer and manufacturer has a history that dates back to 1925, when the company made some of the highest-quality 18K gold rings. For decades, DIANA continued to be one of the preferred high-end choices for engagement rings and wedding rings. DIANA wedding bands continue to be considered among the most luxurious and elegant options available today. Over the years, the styles of DIANA classic engagement rings and DIANA wedding bands have been updated with jewelry materials of a more modern era. However, the timeless designs remain, ensuring that even today�s brides and grooms can enjoy the same high-quality look as couples from decades past. 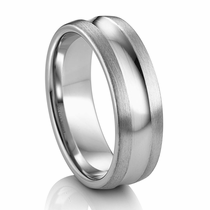 In addition to gold rings, you can now find DIANA palladium wedding rings. This ensures that couples can find a slightly more modern look with these new materials. Better yet, palladium offer a naturally white color. Where white gold is more of an off-white color and rhodium plated to make it bright white. The rhodium wears off quickly however. So palladium is a much smarter choice for you! They are made to last throughout a lifetime of work and play, from the most mundane activities to the grandest adventures. Therefore, these have become some of the most popular DIANA rings, especially in recent years. 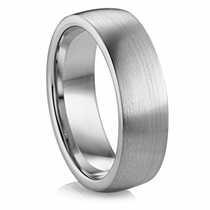 DIANA wedding bands feel fit for a king or queen but are available at budget-friendly prices. You�ll also get a discount by shopping at Titanium Jewelry, where our prices are always a differentiator when compared to other stores. Find the perfect DIANA wedding band for your upcoming nuptials by browsing our full collection from this revered jewelry designer. You�ll enjoy a 30-day money-back guarantee and a 5 year warranty with every purchase. 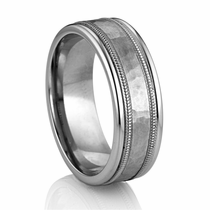 Want to see more palladium wedding bands? 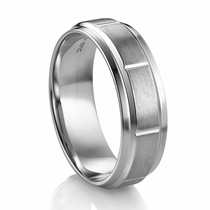 Check out our full collection of palladium wedding bands. The jewelry brand Diana has a rich heritage of manufacturing the finest jewelry made. In 1925, the first rings were created as a limited edition collection by Krementz & Company. From day one, their collection was known for its higher than typical quality. The pieces were manufactured in rich 18K gold. For several decades it was the preferred wedding and engagement brand among higher end jewelry stores, well into the 1980s. In 1992 the collection was renamed DIANA in recognition of its timeless designs and elegant styling. Additional styles were added in platinum, 14kt or 18kt gold, and most recently in precious palladium.